The Drake Trailers Quad AG widener trailer can carry some impressive loads. The Drake Trailers Quad AG widener trailer, which is capable of carrying 50 tonne payloads, is set to be launched onto the Australian market. Specially designed for agricultural work, and with a variable width of 2.5 to 4.5 metres, the trailer utilises Drake Trailers hi-tensile beams and fabricated cross members. 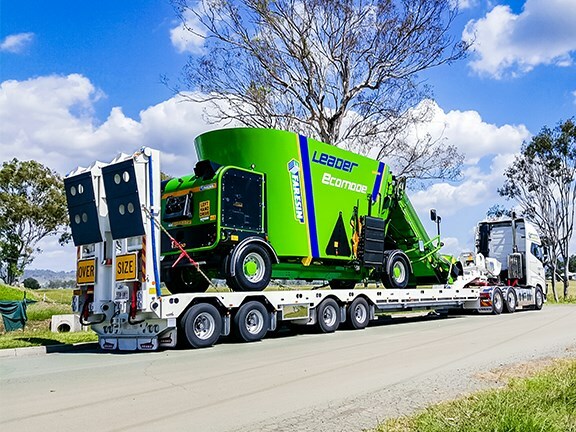 "This Drake 4.5m Ag Widener compliments our range perfectly, and our recent acquisition of O’Phee Trailers, means we can offer agricultural and construction equipment across the country," Drake Trailers says. "When we were called on to design something specific for the agricultural industry, we were only too happy to accept the opportunity." The trailer features the Drake Hydraulic Suspension System, which optimises stability, according to the company. "Backing up the performance is a reliable and proven support system and readily available spare parts, meaning no Drake system is ever out of commission for too long. "Drake Trailers are always adapting to Australia’s ever changing market, as we have done for over 50 years." If you're looking for trailers for sale, check out our listings.